that my haplogroup can be classified as N1b-L732. Most match sample of my Y-STR was Polish, and 10 Koreans etc. As you know, Most of China/Korea/Japanese/Southeast asians are one of O group. divided in central asia(Uzbekistan, KazaKhstan, Kyrgystan. etc) about 35,000years ago. leaders who is non O-haplogroup, and I am possibly not legit of my surname lol. And My height is 183cm, my father's eyebrows strong and not face is not flat. 2 Brothers of my father, one is 182cm and 178cm. And Korean average height is 175cm. But my mum looks very mongoloid with big flat face. Do you guys know answer of voyage of N groups? The reason why you're getting matches with Poles and other northern Euros, is because while N1b is found in these populations, genetic testing is more common in Europe than in Siberia. So N1b has probably been around in your region for thousands of years, albeit at low frequency. Then is there any data which express my paternal ancestor's average race/face/ethnic or physical types of my N1b ? And why so many O and C groups are living in here? No. Haplogroups don't really have any phenotypic expression, although mtDNA can to some extent be correlated with diseases and such, since it's mitochondria, but that's about it. It's probably the result of agricultural expansion in combination with tribalism, or something like that. Perhaps also the spread of the wheel into China helped boost the distribution of these two haplogroups. Welcome to ABF btw! You play StarCraft II? And how about Finland people? The latest analysis from cafe was that it is lack for me to analyze strictly. low sea level. But still don't know the medium regional data of East europe/North Europe and Korea's. N is the brother group of O, so it isn't surprising that there is a lot of O's around you. This is the breakdown of haplogroup F from which most of us Eurasians derive. As for features of your paternal ancestors, the best answer to that is autosomal results. However, I do believe that in traditional patriarchal patrilineal societies with long traditions of arranged marriages and such, there are some associations of Y-dna and autosomal components genetically which end up relating to phenotype. This may be a case like astrology where you see what you want to see, or maybe there is some truth to it. 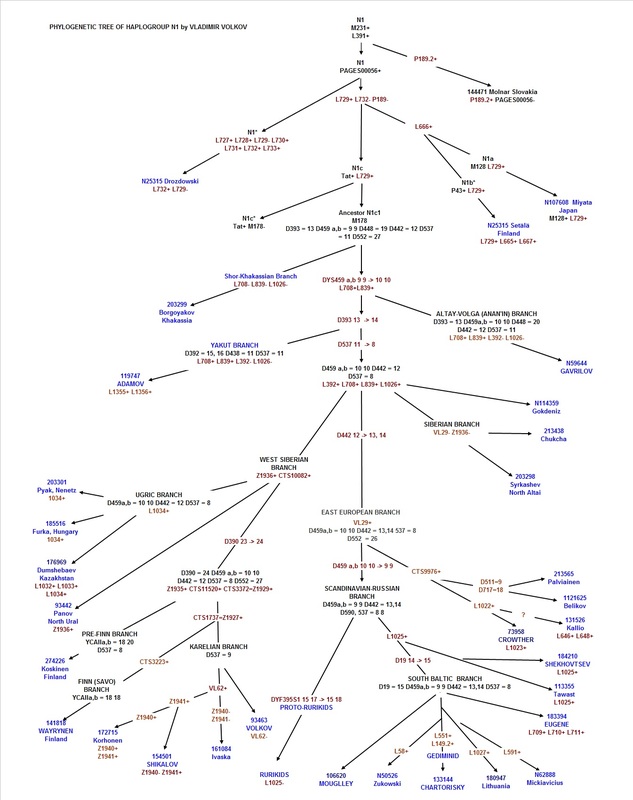 And this is haplo tree of me, and Poles / Belarus / me include in China-vietnam group. But most of my gene matching people inve in worldwide, especially Baltic state, Uralic mountains, Siberia, South China. Last edited by kic009; 2015-01-23 at 19:05. The naming and structure of the Volkov tree is a bit dated. My image link doesn't work. So I will write my Y-STR types. If someone can check this and give me some detail information about my haplo. It will be nice.